"A ponderous key" was the seed that eventually grew into the North Carolina Museum of History, located in Raleigh. The key's owner, a Mr. Kruester, presented it to the Raleigh News and Observer in 1883, claiming the key unlocked a door in North Carolina's first capitol building, which had been destroyed by fire in 1831. The gift spurred the newspaper's city editor, Frederick Augustus Olds, known as "Colonel" Olds because of his service in the State Guard, to write an editorial titled "Some Old Relics." Olds's editorial urged readers to notify him of any "curiosities" they might possess, and the artifacts that he amassed over the next half century ultimately became the North Carolina History Museum's core collection. Olds became known statewide as an insatiable collector. He left the News and Observer in 1886 but continued to accumulate artifacts during the 1880s and 1890s. In 1900 the State Literary and Historical Association appointed him chairman of the Committee on Historical Museums. But the state had no history museum. The State Museum, housed in the agricultural building, did provide space for a few historic objects. The museum had exhibited since 1893 a musket from the Sharpsburg (Antietam) battlefield and the smokestack of the CSS Albemarle. A precedent set, the State Museum appeared to be the logical place to include room for such objects. The North Carolina History Museum's birth became official in December 1902, when the State Museum opened "a small room" called the "Hall of History." Olds, in becoming the museum's director, commented: "For fully twenty years the writer has hoped for such a hall, a place to show what the State has done; . . . pleasing and instructive . . . only limited by space." Exhibits included "the skeleton of an Indian found in Wilkes County" and "two minie balls taken from General Toom's body." Olds soon solicited the newly created North Carolina Historical Commission for support. In November 1903, three days before the commission held its first meeting in Warsaw, he requested and received $50 to reproduce photographs. A productive relationship developed quickly between Olds and the commission's secretary, R. D. W. Connor. They worked together on various projects, such as the Jamestown Ter-Centennial Exhibition, and the commission later became the Hall of History's administrative overseer. Collecting with unbridled enthusiasm, Olds traveled the state, visiting each county on numerous occasions as he created an important but often undocumented collection. Early acquisitions included a tea caddy from the Edenton Tea Party; Confederate battle flags, weapons, and uniforms; a whiskey still "captured in Scotland by Robert Burns, the poet"; and a wine bottle found at Bath, from which Olds speculated that "that roistering devil" Blackbeard had drunk deeply. Soon the Hall of History's collection outgrew its room in the State Museum. Olds and Connor lobbied the General Assembly for money to build what Olds called a "fireproof building" with "ample room" where the work of the commission could "be greatly extended." The state responded by giving the commission's archive collection and the Hall of History's artifacts quarters in the new State Administration Building. The new Hall of History was opened to the public on 14 Mar. 1914. Spurred by the new accommodations, Olds visited each county at least three times between 1914 and 1924 to speak and to obtain artifacts. Finally, slowed by age and poor health, he was compelled to leave his position in 1934. Joseph Carlyle Sitterson became director and immediately began to compile a "scientific catalogue" to inventory and document the museum's thousands of items. The neverending need for space necessitated a move to the first floor of the Education Building in 1939. The Historical Commission began to employ professionally trained curators and administrators, who focused on classifying and organizing the materials collected. The 1940s through the 1970s saw an increase in educational programs and professional services offered by the museum. The Tar Heel Junior Historian Association was established in 1953 to promote history at the junior high school level. The North Carolina Museum of History Associates, Inc., a private, nonprofit support group, was formed in 1975. A succession of capable and forward-thinking administrators-among them Mattie Erma Edwards Parker, Joye Jordan, and John Ellington-guided the museum as it grew into a modern facility. 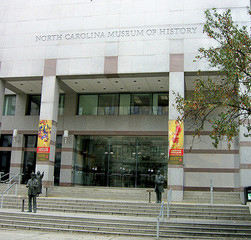 In July 1965 the Hall of History was renamed the North Carolina Museum of History. Three years later the museum moved more than 90,000 artifacts into a new $3 million building at 109 East Jones Street, sharing space with the North Carolina Archives and History and the State Library. The museum finally received a home of its own in April 1994, when a $29 million, 55,000-square-foot facility, complete with classrooms, a research library, and an auditorium, opened at One East Edenton Street. Over the years, satellite museums were established in Fayetteville (Museum of the Cape Fear), Elizabeth City (Museum of the Albemarle), and Old Fort (Mountain Gateway Museum). The North Carolina Museum of History, started as a haphazard collection of historic odds and ends managed by one person, entered the twenty-first century with a staff of more than 100-curators, conservators, registrars, artifact handlers, research assistants, and others-and more than 250,000 items relating to the state's history. The artifacts are broadly categorized as pertaining to agriculture and industry, community history, costumes and textiles, folklife, furnishings and decorative arts, military history, or political and socioeconomic history. In addition to standing exhibits such as the North Carolina Sports Hall of Fame, the museum mounts shorter-term exhibits with themes such as "health and healing" and the Civil War. Valerie Howell, "The People Museum: Alive with the Past," in North Carolina Stories: The Grand Opening Celebration of the New North Carolina Museum of History Building (1994). "North Carolina's New Hall of History," Raleigh News and Observer, 28 Dec. 1902. W. J. Peele, ed., Literary and Historical Activities in North Carolina, 1900-1905 (1907). Harry S. Warren, "Colonel Frederick August Olds and the Founding of the North Carolina Museum of History" (M.A. thesis, East Carolina University, 1988). North Carolina Museum of History. Image courtesy of Flickr user Dave Crosby. Available from http://www.flickr.com/photos/wikidave/4080723482/ (accessed August 24, 2012). Exhibit at North Carolina Museum of History, 2008. 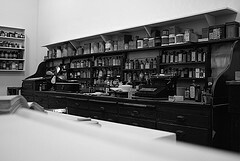 Image courtesy of flickr user Jeffrey Cohen. Available from http://www.flickr.com/photos/digitalpapercuts/3013638227/ (accessed August 24, 2012). 1 January 2006 | Warren, Harry S.
Thank you for posting both questions to NCpedia about the Ruth Coltrane Cannon Cup. I just emailed you to connect you with Reference Services at the NC Government & Heritage Library. Additional contact information for them may be found at http://statelibrary.ncdcr.gov/contact.html. Someone will follow up with you on this soon. I believe my mother, Margaret Hathaway Jones was one the earliest recipients of the Ruth Coltrane Cannon Cup, possibly 19 48-50 era. It was awarded for her efforts in the preservation of the James Iredell House in Edenton, NC. Could you please verify.